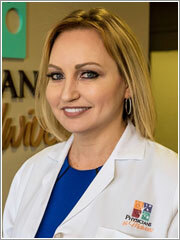 Stephanie C. Barrett is a Certified Nurse Midwife (CNM) and is a graduate of the George Washington University, University of Florida (GO GATORS! ), and Shenandoah University, where she was awarded the distinction of Outstanding Nurse Midwife. Before pursing her dream of becoming a CNM, Stephanie worked as a Labor and Delivery Nurse, Travel Nurse & Nurse Manager. She also holds a Master’s degree in Nursing Management from Walden University. Stephanie was inspired to attend birth following the difficult delivery of her first daughter, Taylor. She strives to match the inspiring care she and Taylor received during that unnerving time. Her clinical experience has focused on high-risk perinatal nursing, and she is also interested in promoting women’s sexual health and wellness. Coming to P&M from the Florida sunshine, Stephanie loves the community and culture of Arlington Virginia, where she currently resides with her husband, Gil, daughter Daphne and their twin boys, Calvin & Miles. Her daughter Taylor lives and works in D.C, as a project manager. Michael and Jeffery, her sons, are both working in business management and reside in Orlando Florida. In her free time, Stephanie enjoys hiking, family time and personal fitness. She is delighted to be a part of P&M where she can care for women, while maintaining a healthy work/life balance with her own family.